Last month I posted about the first two steps of my revision process and said my next step was to write a few scenes from non-main character viewpoints. I’d never done this before, and I don’t know why. I think it just never occurred to me. Well, now that I have, I will definitely be doing it again for future manuscripts. As I read through my first draft, there were several scenes where I thought, “Why did [character] do that?” It wasn’t that I thought they wouldn’t take a particular action–more that I needed to get inside their heads to make it believable to a reader. Because, unfortunately, I didn’t believe it myself yet. The problem was that even though I’d done character outlines for my main antagonist, secondary antagonist, and love interest before I started writing, I still didn’t really understand what made them tick. And I couldn’t write the MC’s perceptions of them if I didn’t know them. 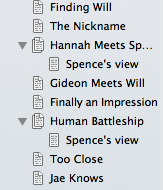 As I’ve mentioned before, I use Scrivener, which encourages you to write in scenes. I decided which scenes needed the most shoring up and added sub-scenes under each of those, labeling them as the other character’s view. (You can see an example to the right.) I then approached the scene from the other character’s view, writing through what currently didn’t make sense. In some cases–particularly with the main antagonist–I started before the MC entered the scene so I would understand how he arrived at that point. Here are a few of the questions I needed to answer. Keep in mind some of these apply to both the antagonist and love interest, while others are specific to one or the other. What are his mannerisms and facial expressions? How good is he at hiding his emotions? Is he putting on an act or being himself? What tactics does he use to get her attention? What tactics does he use to throw her off? What is he thinking when he says x? What does he hope to gain by taking x action? What does he think she will do? What does he see when he looks at her? Why is he attracted to her? Why did he do this evil thing? Was it premeditated or in the heat of the moment? How does he react when cornered? Is he calm and calculated or panicked and reaching for anything to save his skin? What is he concealing from her and for what purpose? Does he rely more on logic or emotion? The answers to these questions influence the decisions the character makes, how he acts, what he says, and how he feels. Before I took a trip inside their heads, I had very little idea how they would look to the MC. But afterward, it was very clear what the MC would see when she interacted with these characters–of course colored by her own view of the world. In addition to helping me better understand my secondary characters, this exercise also clarified a number of plot issues. For example, the whole story hinges on the antagonist telling the MC something at the beginning of the story that begs the question: Why would he even bring that up? And to be honest, I didn’t know. I just knew that he had to or there wouldn’t be a story. But once I wrote his view of the scene and backed it up even further to how he got there, it made perfect sense. Now that I’ve worked all that out, I just have to make sure that comes through in what the MC sees. I’m excited to see it all play out. After all, revising is my favorite part :). I’m not sure why I had so much trouble understanding the secondary characters in this manuscript. Perhaps it’s because I’m writing contemporary this time and I feel like everything has to be more explainable than when there’s an element of magic or fantasy. Whatever the reasons, this worked! Have you ever tried writing scenes from other viewpoints? Did it help?